When faced with difficult challenges in life, how do you move forward? How do you ignite your heart and embrace that fiery passion for life? What can you do to get yourself unstuck so you can step into your life's purpose? Whether it's through decisions of our own or circumstances out of our control, there are times when we all experience the darkness and pain that life can bring. However, it is not these events that define us, but how we respond to them that determines who we are and where we go from there. Author Pennie Hunt has pared down years' worth of life lessons and advice that helped her through her darkest times to create this profound and insightful book, Love Your Life - NO MATTER WHAT. 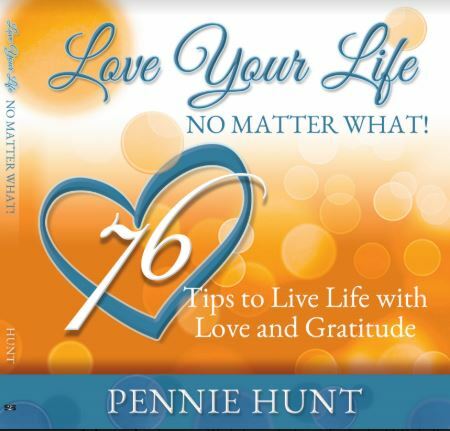 In it are 76 bite-size tips that will help you navigate the ever-shifting waters of life by learning how to live your life with love and gratitude.